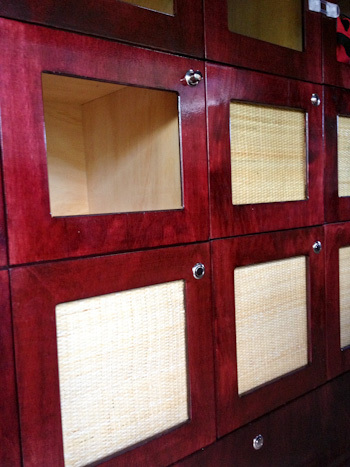 When the cabinet-maker was fashioning the cupboards for our housebus, I asked him to leave the doors as empty frames so I could soften them with woven rattan. I wanted to break up the wall of timber with another natural texture, and rattan seems to be an easy material to work with. I was also trying to consider the weight of the over-all housebus cabinetry. Every ounce of weight that I add to the bus will reflect in its fuel efficiency, and using lighter-weight materials means that we can travel with the same comfort for less. This week, I’ve had an opportunity to tackle the unknown job of installing rattan onto the fronts. First I soaked the wicker, then I used thin pieces of wood to hold it into place as I stapled it onto the cupboard doors. My first door was the experimental one, and I may need to re-do that later. One-by-one, I'm adding woven rattan to the cupboard doors. I plan to apply a colour wash to the wicker later on. 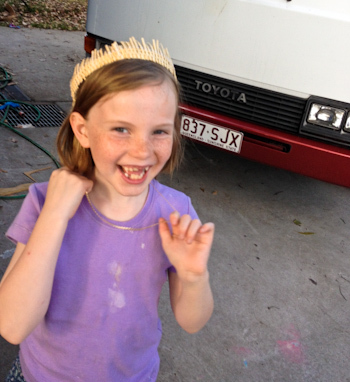 Aisha takes one of the rattan off-cuts and fashions it into a tiara — the Princess of Wicker! Now that the cupboard doors have fronts, I’ll be able to start packing our belongings into them. Then we’ll be able to continue our travelling life in The Gifted Gypsy! Love how creative you are! Since cabinets are the most prominent component of a room, cabinet selection is vitally important to create a beautiful look of a house. I enjoyed reading your ideas. Thanks.